The Castro District, with its bountiful supply of Victorian homes, was once known as Eureka Valley. After World War II, when thousands of gay men, many of them ex-sailors, converged on San Francisco, the area became “the gay Mecca” of California. 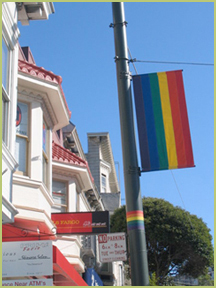 The neighborhood eventually was christened the Castro and gained national attraction in the 1970s with the Gay & Lesbian Pride Parade and the assassinations of Mayor George Moscone and Supervisor Harvey Milk, who was one of the first openly gay elected officials in the country. Today, the neighborhood is a vibrant business district with many gay-themed and -owned shops and restaurants, though heterosexuals are always welcome. The neighborhood is also for known for the fabulous Castro Theatre, which is the preferred venue for many of San Francisco’s film festivals, as well as independent and foreign films and restored classics. Dolores Park, which offers spectacular views of San Francisco, is a favorite for children, dog owners, sunbathers and performance groups like the SF Mime Troupe, SF Symphony and the annual Dyke March festival.